Colin has only done two cover illustrations for Pern books, but he is notable because when Anne was asked in 1983 which cover artist had come closest to depicting the Pernese dragons as she saw them herself, her reply was Colin "because he listened to my directions." 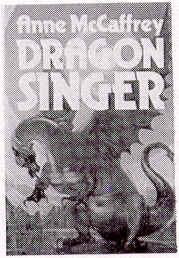 "Dragonsinger" cover art. Found on the British hardcover edition, published by Sidgewick & Jackson in 1977. "F'nor and Canth" poster commissioned by Anne for the 1972 World Science Fiction Convention in Los Angeles, CA. 500 copies were sold. Poster measures 14 11/16" x 20 13/16". This artwork was re-used as the cover of Dragondrums mentioned next. "Dragondrums" cover art. Found on the British hardcover edition, published by Sidgewick & Jackson in 1979. I still tend to think of Michael Whelan's art as the correct image of a Pernese dragon, and to my eye there are parts of these dragons that do not match Anne's own description of the dragons in the novels. But there are parts of these illustrations that I think are more correct than Whelan's, namely the forked tongue, and the headknobs on Canth. I like Whelan's wings better, but mostly because the anatomical details are not apparent on these images. And I think Whelan gave them the correct number of claws, five. I do like the head of the dragon on Dragonsinger here, which is equine-shaped as it's supposed to be; but it looks like it has ears instead of headknobs. And I still tend to picture Whelan's heads in my own mind... Well, I could probably extend this discussion a lot longer, but I'm going to cut it off here. Eventually I'd like to scour the books for all descriptive details and write a new webpage "What the Dragons should look like."